Have you ever wanted a cookbook that was just for kids and offered up healthy, all vegan recipes? Well now you have it! The Kidlicious cookbook is exactly that, and more! This cookbook comes in a convenient-to-use spiral bound that is filled with full color photos. Kids are taken on a journey through this book that includes breakfast, eating rainbows, lunch box options, family meals, and more. There is even information on eating healthy, reading labels, and a few Biblical scriptures to boot. This book is filled with recipes that kids will want to try, and will want to get involved in creating. 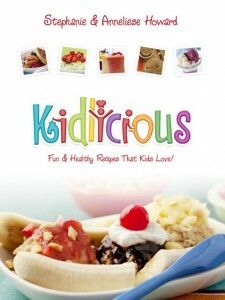 Vegetarian and vegan parents are likely to be quite pleased with the Kidlicious cookbook. My 8-year-old daughter thumbed through it, liking everything she saw, and quickly decided she wanted to make the zebra cake recipe. Together we prepared the zebra cake to take to a vegan potluck we were attending. It turned out fabulous and we had a great time making it together! From such vegan recipes as rice crispy treats to sandwiches on a stick, this book offers an array of great recipes to try. There are recipes that pack a healthy punch, some that raise the bar on packing lunches, and some desserts that are sure to please. Two thumbs up for the Kidlicious cookbook. It’s a book that both kids and their parents are going to love! The author provided a review copy. It’s now available on Amazon (affiliate link). I have personally tasted the skillfully created recipes of this author while attending Emmanuel Institute of Evangelism and I was , in all truthfulness, unbelievably shocked at the great flavor of her vegan cuisine. 5 out of 5 stars. I’m very excited about this cookbook and will update the review with a link to purchase it when it’s released. I’ve waited a long time for an all-vegan cookbook to use with my kiddo, and to hear that it’s spiral bound and has yummy recipes like Zebra cake — I’m over the moon! Looks great! Zebra cake sounds fab! OK, it’s official – we have this book & it’s a hit with our family. Kiddo has already made us the monkey pancakes (so cute! ), refrigerator pickles, and breakfast fruit pizzas. Tonight, dinner will be sandwich on a stick, served with ants on a log. How fun! As a mother cookbook always being a helpful part in my life. Because most of the time my kids request me for providing some delicious food for them. But I want to provide them not only delicious meals but also healthy meals for my kids.That’s why this cookbook help me very much for providing healthy meals to our kids.